On the subject of crawl spaces it is often hard to determine what the right information is. Beyond that, it is even more difficult to muck through the fancy sales pitches and smoke and mirror tactics to get enough of the right information to make an educated decision. That's where we come in, no high pressure sales techniques, no smoke and mirrors and no fancy sales pitches. Our main focus is to get good information into the hands of anyone that seeks it, for free. My name is Matt Leech and I have been in the building and remodeling industry since 1989. In my career I have been trained by some of the best tradesmen in the industry. The depth of my experience ranges from foundations to roofing (and everything in between) to corporate manager and business owner. I am a hands on person and I enjoy my work. I learned my trade in the field, working in the sun, the rain and the bitter cold winters of Michigan. 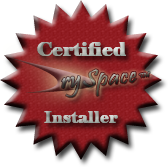 I have personally installed the DrySpace™ vapor barrier in 300+ homes in Michigan, Ohio and Indiana. We built this site to share that experience and information with you. We are unlike other companies that just sell their products, we understand the crawl space environment. We are the first company in the World to offer solutions and quality products to the the DIY homeowner. We support our existence with the sale of our DrySpace™ vapor barrier products, but by no means do we require you to purchase from us in order to gain our help. Your patronage is greatly appreciated and will allow us to continue to help others that cross the same path which brought you here. I am always available to talk with you and to help you discover the proper means to solve your crawl space problems. Feel free to contact me Toll Free 877.379.7658 I'm honored to help and love to hear from our customers, even if you only have a question.